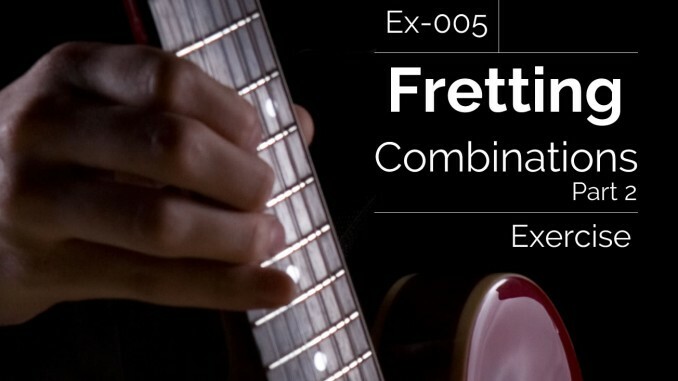 This exercise expands on the Fretting Combinations exercise. This exercise will train both your fretting hand and your picking hand by playing all the fretting combinations and all the picking combinations. The picking combinations are given with the traditional symbols for downstroke ( ) and upstroke (V). To use this exercise, play the exercise below but choose a picking combination to use. You can mix and match fretting combinations with picking combinations. Example: With picking combination 6 ( V V), you use a downstroke then an upstroke then another downstroke then another upstroke. So you would play fretting combination 1 (1-2-3-4), by playing fret 1 with a downstroke, fret 2 with an upstroke, fret 3 with a downstroke, then fret 4 with an upstroke. You would then repeat this for all the fretting combinations.